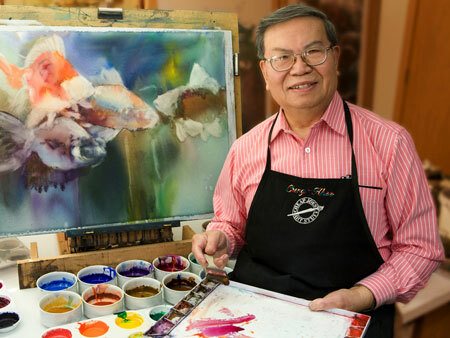 Cheng-Khee Chee, Associate Professor Emeritus of the University of Minnesota, is a Dolphin Fellow of the American Watercolor Society, signature member of the National Watercolor Society, Transparent Watercolor Society of America (Master Status), Watercolor USA Honor Society and many others. He is listed in Who’s Who in America, Who’s Who in American Art, Who’s Who in American Education, and Dictionary of World Chinese Artists Achievements. He has been represented in numerous national juried exhibitions and captured over 200 honors, including the American Watercolor Society Silver Medal, Transparent Watercolor Society of America Skyledge Award (First Place), Allied Artists of America Gold Medal, and Knickerbocker Artists USA Grand Award Gold Medal and Purchase Prize for Excellence. His solo exhibitions include the Tweed Museum of Art of the University of Minnesota, Duluth, 1982; China traveling exhibition, 1987; Singapore Art Museum, 1997; and Bloomington Art Center Inez Greenberg Gallery Inaugural Exhibition, 2003. Among his publications are The Watercolor World of Cheng-Khee Chee (book 1997), The Work of Cheng-Khee Chee (instructional manual 2003), Old Turtle (illustration 1992), Swing Around the Sun (illustration 2003), Noel (illustration 2005), and numerous contributions to books and magazines. He was featured in the Artist’s Magazine (December 1997), Watercolor Magic (summer 2000) and Watercolor Magazine (An American Artist Publication, winter 2002). The Creative Catalysts Productions of Oregon produced his 6-volume instructional DVDs based upon his workshop and were released in 2005. Cheng-Khee Chee Thoughts on college graduation, 1960In 2007 Chee coordinated with the Jiangsu Watercolor Research Institute in Nanjing, China to organize the first Invitational Exhibition of Contemporary International Watermedia Masters. 68 artists representing 13 countries worldwide were included. The exhibition was held in Nanjing from November 19 through December 2, 2007, and later traveled to other cities. Chee was the recipient of the 1994 University of Minnesota system-wide University College Distinguished Teaching Award and the 1994 University of Minnesota, Duluth Campus Chancellor’s Distinguished Services Award. In 2004 the Duluth Depot Foundation honored him with the Art and Culture Community Enrichment Award. In 2008 his Alma Mater Nanyang Technological University in Singapore honored him the Alumni Achievement Award. In 2009 the University of Minnesota, Duluth School of Fine Arts honored him the membership of the society of Prometheans, recognizing his outstanding artistic accomplishments. He is a popular workshop instructor and national show juror. His breakthroughs in concepts and processes have greatly influenced the direction of watermedia painting. Both East and West experiences and influences have shaped Chee’s artistic career. Over the years he has explored and experimented with ways to synthesize the concepts and processes of both traditions. His work comprises many styles from traditional to nonobjective. Chee’s ultimate goal in painting is to achieve the essence of Tao, the state of effortless creation. He hopes to produce paintings that are the synthesis of East and West, realism and abstraction, and the visual realization of his inner being.